So… you have your new photo equipment. Cool... now what? Should we just jump in the water with it? Now, go and ask a completely new underwater photographer about how they have planned to actually carry out their first photo dive, and they usually have not even considered it. For that reason alone, many first photo dives are rarely successful. Although it is quite different to take pictures underwater, it is not that hard to learn. But you need to put aside your commonly held notions about photography and learn to prepare in a different manner. You may well be an experienced photographer and know your camera well, but once you put it in a housing, the buttons and where they have been placed become a whole new ball game! So always start out by taking the time to get to know your housing, where the buttons are and (most importantly) be able to identify them with your eyes closed. And let’s be honest... You didn’t really read the manual, did you? You may think you have, and you might have told your friends that you did, but chances are more likely that you haven’t done it. The secret to camera manuals is not to try and read them all at once, but to get started by running over the table of contents as fast as it takes you to read the letters. Then, do it again, just a little slower, so you now have the overview. Most manuals repeat themselves forever. But, by knowing the main headlines, you will know where to start reading once you have the need for topic. You will need to know how to turn the flash on and off, how to set the ISO and the basic settings associated with changing between Auto and Manual, as well as adjusting the f-stop and shutter speeds, plus how to enter the menu and run through the settings. Just forget about the detailed menu settings for now, as they can wait until later. 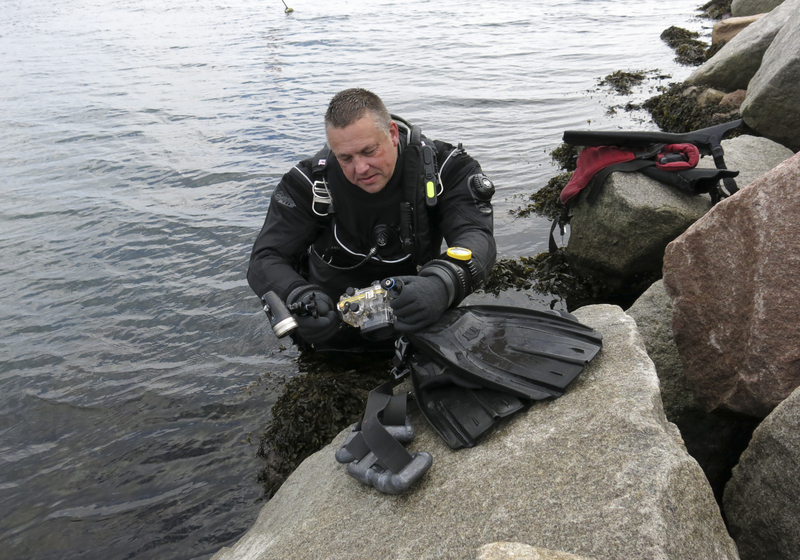 Rule #1, when you are about to go diving, is to make sure you have set up your camera equipment at home. So by taking the time to mount the camera in the housing while at home, sitting at a table with a clean surface, you will eliminate that risk. Start by preparing the camera and housing completely for the dive. Then, take it apart again, so that you can learn about battery settings, how your buttons work and if the camera sits in the housing the way the manufacturer intended. Taking these steps also increases the chances that you will get potential problems solved in good time before the day you want to go diving. The next thing you need to decide is how you want to operate the camera. At this point, you might be thinking there are so many settings, how does one possibly decide on the right ones to choose? Well, when it comes to camera settings, there are three basic things that control your exposure: your aperture (f-stop), your shutter speed and your ISO setting— which are often collectively referred to as the “ASI”. Although you may think your camera has none of these features, it is exactly these three settings that control the camera’s operation when you choose one of the many shortcuts found on most cameras. Virtually all cameras have an “Auto” button, usually called “P”. It is important that you know where it is, because it is your back-up if every other setting you have decided to go for fails. It will make certain that you get out of the water with at least some reasonable images on your memory stick. There are many other settings, such as the “Portrait” and “Sport” settings, which you will probably wonder about. The possibilities are many, but they all lead back to the three main ASI settings of Aperture, Shutter and ISO. It is important not to be too concerned about the other settings, if you are not familiar with them, and keep things simple by using the settings you do know and then plan from there.